With the event of mixed martial arts (MMA) becoming mainstream in the media, more and more people are looking to martial arts and self-defense classes as an alternative to the usual gym and fitness routine. At Mayo Quanchi Judo & Wrestling, we have been training in and teaching martial arts long before the media hype. We proudly bring forth this tradition to new generations of martial artists by offering a variety of classes to our students. 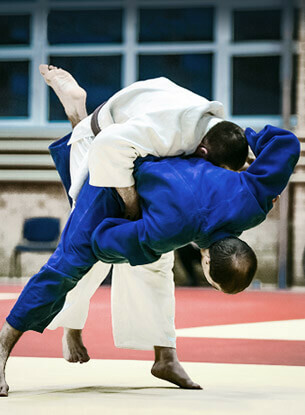 Our Judo classes are run by World Class Sensei’s and trained Judo instructors. Rank can be determined by the color of one’s belt. Dojos, aka Judo schools, are the training locations where students practice on mats. Students, known as Judoka, wear Judogis, the white outfits many associate with karate. Judo is a strenuous martial art designed for those capable of exercising at mild to intense levels for varying periods of time. The intense nature of Judo offers the benefits that can come from regular exercise, such as weight loss, muscle gain, and a healthier heart. Flexibility, focus, coordination, and discipline can increase as well.